In 1928, several homes along Washington Boulevard between Scoville and East Avenues were acquired by the Dominican Fathers of St. Joseph’s Province. A “monumental structure for the education of boys” was to be constructed on the site. 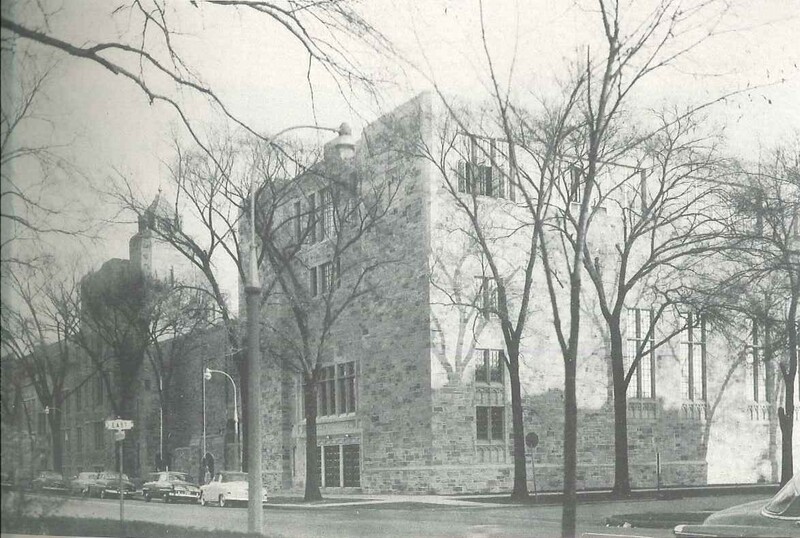 The new school would be a “modified gothic structure of Massachusetts seam-faced granite with Indiana limestone trim,” similar to the Dominican House of Studies in River Forest, and would have an ultimate capacity of more than 1,000 students. Demolition of the houses began in October 1928, and the first 200 students arrived for classes in September 1929. Rev. Leo C. Gainor, O.P., was appointed the first president of the school. Originally from Indiana, Father Gainor had served as a professor of sociology and economics at Providence College in Rhode Island before accepting the Oak Park post. The school was named for Dominican bishop Edward Fenwick, first bishop of Cincinnati. According to school leaders, the selection recognized the advancement of education promoted by Bishop Fenwick. Designed by New York architect Wilfred E. Anthony, the school has several architectural highlights, including a number of carvings surrounding the main entrance. The main portal is flanked by statues of St. Dominic Guzman, who founded the order, and St. Thomas Aquinas, a medieval theologian and the patron of Catholic schools. The carved shields between the two sculptures include the Papal Arms, the device of the state of Illinois, the escutcheons of the Dominican Order and the Province of St. Joseph, the shield of the United States, and the device of St. Dominic. Other symbols that can be found include the lily of St. Joseph, an apple tree symbolizing knowledge of good and evil, the Book of Knowledge, an oak leaf for fortitude, a candle for study, and a cog wheel for industry and science. For nearly 90 years, Fenwick High School has educated generations of young men—and, since 1992, young women. Since its founding, Fenwick has maintained a 100% college matriculation rate, with students attending many top American and international universities.